Expired Domains is FREE desktop program to easily find soon to expire domains, organize search sets of keywords, apply rules and more. 130.000 domains will expire in next five days. with Expired Domains software you are taking advantage of countless hours people have put into finding great domains and now they are expiring..
● Download a full, next - 5 days list of domains that are about to expire. ● Build a list of keywords you are interested in, apply search rules to each keyword and put them into search sets. ● See which domains match your rules, sort them into grups, save best domains into drafts. 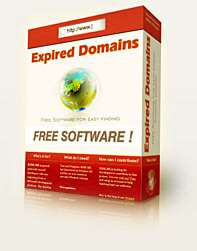 Expired Domains is free Windows desktop application which greatly helps you find domain names that are expiring soon. This tool is developed for in-house use but we decided to release it to public in hope it will be usefull for many people search for desired domain name. Domain name market is heavily oversatured these days. There are more than 80 milion domains registered in total. Finding a right domain name is sometimes nearly impossible task, especially if you are not willing to pay extra cash to buy a domain that is already grabed and now for sale. If you have already tried to type in domain names for availability you probably had zero success, especially if you have searched for more generic words and keyphrases. The author of this program remembers he searched virtually for weeks to find some more or less usable names that he could use, and that was years ago. Since then, finding a good domain have gotten harder. Much harder. You should not spend your time checking out variations in a hope someone, somehow forgot to register it - it won't happen believe me. All good, ok and even not so good domains are already registered. So, what to do? Simply, you must use someones other hard work and thinking. People have already contemplated all possible variations, synonyms, they know how domain names are valued, know about keywords, type-in traffic etc. Every day tens of thousands domains names are expiring. Every single day. That is hell of a lot expired domains to pick from. The reasons why people "let" domains expire are various. Could be somethins as banal as forgeting to renew, could be as serious as physical death. Many let domains expire because they don't need them any more. But that is not your bussiness to think about. "Expired Domains" will help you grab and search through all those domains that are expiring in a organized matter. You will be amazed how many good domains are expiring every day. With Expired Domains you should be able to find a domain you are looking for. It may take some time, and you should not expect to grab something like credit.com. Sometimes you will also need to use a backorder service to assure (as much as possible) that someone who aimed at the same domain as you doesn't grab it before you does.